High-intensity interval training continues to be a top fitness trend. In fact, ACSM’s Health & Fitness Journal named HIIT as the number two expected fitness trend for 2015. It’s popular because it’s effective— high-intensity interval training studies continue to reveal rapid gains in fitness training in only 10 to 20 minutes per week. Scientists have discovered that HIIT is effective in athletes, recreationally active adults, children, lung and heart patients, and older adults. Most studies show that after a few months, people get similar results from continuous and interval training. However, fast and slow training recruit different muscle fibers and influence metabolism differently. If you want to burn fat fast for summer, try combining two to three days per week of interval training with three days per week of less strenuous low intensity, longer duration aerobics. This is a program that will help build fitness, cut fat, stick with your program and prevent injury. HIIT for Health and Fitness: Less is More! High-intensity interval training sounds too good to be true. In studies of moderately trained people, practicing HIIT for only 20 minutes in two weeks triggered changes in aerobic capacity and endurance that took months from traditional endurance workouts practiced 30 to 60 minutes per day. Few exercise techniques are more effective for improving fitness rapidly than HIIT. • Distance refers to either the distance or the time of the exercise interval. • Repetition is the number of times the exercise is repeated. • Intensity is the speed at which the exercise is performed. • Rest is the time spent recovering between exercises. Canadian researchers found that six sessions of high-intensity interval training on a stationary bike enhanced endurance, maximal oxygen consumption, muscle glycogen and mitochondrial capacity (mitochondria are the powerhouses of the cells). The subjects made these amazing improvements by exercising only 20 minutes over a period of two weeks. Each workout consisted of four to seven repetitions of high-intensity exercise (each repetition consisted of 30 seconds at near maximum effort) on a stationary bike. Follow-up studies showed that practicing HIIT three times per week for six weeks improved endurance and aerobic capacity just as well as training five times per week for 60 minutes. These studies (and more than 60 others) showed the value of high-intensity training for building aerobic capacity and endurance. Do not practice interval training more than three days per week. Intervals are exhausting and easily lead to injury. Let your body tell you how many days you can tolerate. If you become overly tired after doing interval training three days per week, cut back to two days. If you feel good, try increasing the intensity or number of intervals (but not the number of days per week) and see what happens. As with any kind of exercise program, begin HIIT training slowly and progress conservatively. Although the Canadian studies showed that HIIT training produced substantial fitness improvements by themselves, it is best to integrate HIIT into a traditional aerobics exercise program. • High-intensity training could be dangerous for some people. A physician might be reluctant to give certain patients the green light for this type of exercise. • Always warm up with several minutes of low-intensity exercise before practicing HIIT. High-intensity exercise without a warm-up can cause cardiac arrhythmias (abnormal heart rhythms) even in healthy people. • HIIT might trigger overuse injuries in unfit people. For this reason, it is essential to start gradually, particularly if you are unfit. Exercise at submaximal intensities for at least four to six weeks before starting high-intensity interval training. Cut back on interval training or rest if you feel overly fatigued or develop overly sore joints or muscles. • Combining high- and low-intensity exercise provides variety, causes a more consistent increase in metabolic rate and calorie burning, and makes you less susceptible to muscle and joint injuries. • It is important to rest from three to five minutes between repetitions. The benefits of intense exercise have been supported by a series of studies conducted for more than 10 years at Laval University in Canada (led by Tremblay and colleagues) and recent studies conducted at the University of Virginia under the direction of Art Weltman. These results showed that people who train intensely develop more muscle and lose more fat than those who exercise at lower intensities. People exercising more intensely lost much more body fat, even though they exercised for less time than people training at moderate intensities. Researchers from Duke University led by Cris Slentz found similar results. The eight-month study showed that people could lose weight through exercise alone without dieting (the average energy intake was slightly more than 2,000 calories per day). People who exercised intensely lost much more fat than those who trained moderately. However, even moderate-intensity exercise caused some fat loss. You use more fat as fuel when you exercise slowly but you lose more body fat when exercising intensely. High-intensity training increases release of fat from fat cells, fat use for fuel, and increased metabolic rate after exercise more than low- or moderate-intensity exercise, so you lose more body fat. Also, high-intensity exercise decreases appetite more than moderate- or low-intensity exercises. • Practice HIIT on an elliptical trainer or stationary bike two to three days per week for 10-20 minutes each workout. Sprint for 30 to 60 seconds at 100 percent of maximum effort on a stationary bike or elliptical trainer, followed by light recovery exercise for two minutes. Each workout, do six to 10 sets of these maximum sprints. You can do these sprints on the track (sprinting), stationary or road bike, elliptical trainer or even dribbling a soccer ball. • Train with weights explosively at least two days per week. Explosive weight training increases muscle mass that will give you a higher metabolic rate and promote fat loss. Increased muscle mass helps burn more calories during the day. Also, you will look fit and toned if you have more lean muscle. • An effective weight-training program should create high levels of muscle tension. High speed, explosive training overloads the fibers and creates more muscle tension than any other form of training, yet few people incorporate it into their training programs. • Do 30 to 60 minutes of aerobic exercise at 60 to 85 percent of maximum effort, three to five days per week. Examples include walking, running, cycling, swimming, gym aerobics and cross-country skiing. This will burn about 500 to 1,000 calories a day, which is enough to get rid of nearly a pound of fat per week if you train five days per week. That doesn’t sound like a lot, but you will lose fat and not muscle. What’s more, you will lose weight and it will stay off. Add a sensible diet to the equation and you will rid your body of excess fat before you know it. • Eat a well-balanced, reduced-calorie diet. Eat a balanced diet containing a variety of foods. Include wholesome foods, such as fruits, vegetables, lean meats, whole grains, nuts and fish. Avoid simple sugars and trans fats. The Atkins type diet— high in proteins and fats and low in carbohydrates— is not appropriate for this kind of exercise because you need carbs to train intensely. The Atkins diet works well for people who want to lose weight but are only moderately active. Reduce caloric intake slightly (300 to 500 calories per day) for long-term success. Healthy eating is more effective for long-term weight control than dangerous crash diets. • Back off if you get injured. Intense training greatly increases the risk of overuse injuries. People who train intensely ride a thin edge between peak performance and injury because they push hard all the time. Back off on the program when your knees, Achilles tendons, hips or back hurt. Take a few days off and then begin again at a lower intensity. High-intensity, intermittent exercise on an elliptical trainer or stationary bike, 10 to 20 minutes. This technique involves doing 30- to 60-second bouts of maximal exercise immediately followed by one to three minutes of submaximal exercise. Warm up by exercising for two minutes at a comfortable pace. 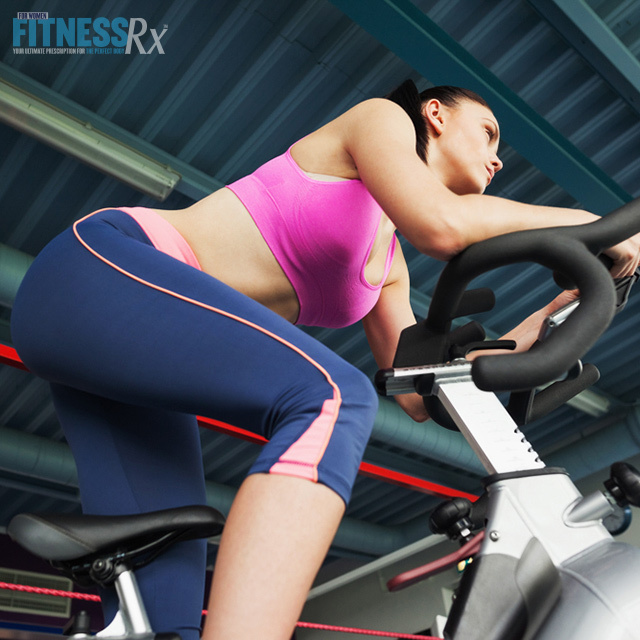 Add resistance to the elliptical trainer or stationary bike as fitness improves. High-intensity explosive weight training: chest and arms. Aerobics, 30 to 60 minutes. Choose an aerobic exercise that you enjoy, such as walking, jogging, cycling, swimming, gym aerobics or cross-country skiing. Exercise continuously for 60 minutes. Build up slowly if you cannot exercise for that long at the beginning of the program. High-speed explosive weight training: Legs, back and core. Aerobics, 30 to 60 minutes. High-intensity, intermittent exercise on an elliptical trainer or stationary bike, 10 to 20 minutes. Burgomaster, K. A., et al. Six sessions of sprint interval training increases muscle oxidative potential and cycle endurance capacity in humans. J Appl Physiol. 98:1985-1990, 2005. Fahey, T.D., P. Insel, W. Roth. Fit and Well. New York: McGraw Hill, 2014 (11th edition). Gaesser, G.A and S.A. Siddhartha. High-intensity interval training for health and fitness: can less be more? J Appl Physiol 111: 1540–1541, 2011. Gibala, M. J. High-intensity interval training: A time-efficient strategy for health promotion? Curr Sports Med Rep. 6:211-213, 2007. Irving, B. A., et al. Effect of exercise training intensity on abdominal visceral fat and body composition. Med Sci Sports Exerc. 40: 1863-1872, 2008. Laforgia, J. R.T, et al. Comparison of energy expenditure elevations after submaximal and supramaximal running. J. Appl. Physiol. 82: 661-666, 1997. Physical Activity Guidelines Advisory Committee. Physical Activity Guidelines Advisory Committee Report, 2008. Washington, DC: U.S. Department of Health and Human Services, 2008. Rozenek, R., et al. Physiological responses to interval training sessions at velocities associated with VO2max. J Strength Cond Res. 21:188-192, 2007. Shepstone, T.N., et al. Short-term high- vs. low-velocity isokinetic lengthening training results in greater hypertrophy of the elbow flexors in young men. J Appl Physiol 98: 1768–1776, 2005. Slentz, C.A., et al. Effects of the amount of exercise on body weight, body composition, and measures of central obesity. Arch. Intern. Med. 164: 31-39, 2004. Trapp, E. G., et al. The effects of high-intensity intermittent exercise training on fat loss and fasting insulin levels of young women. Int J Obes. 32: 684-691, 2008. Tremblay, A., et al. Effect of intensity of physical activity on body fatness and fat distribution. Am J. Clin. Nutr. 51: 153-157, 1990. Tremblay, A., J. Simoneau, and C. Bouchard. Impact of exercise intensity on body fatness and skeletal muscle metabolism. Metabolism. 43: 814-818, 1994. Treuth, M.S., G.R. Hunter, and M. Williams. Effects of exercise intensity on 24-h energy expenditure and substrate oxidation. Med. Sci. Sports Exerc. 28:1138-1143, 1996.